The fully trained tracking dog has the unique ability to use their highly developed olfactory system to follow the trail of a total stranger who has passed through an area and identify any personal objects along the way. Even though the footprints are invisible to the human eye, thousands of skin cells drop from a person as they move. Using their keen sense of smell, a dog can be taught to focus solely on an individual's scent. The tracking dog must learn to ignore distractions such as local wildlife. Various weather conditions can affect the difficulty of the trail such as wind, rain, humidity, or snow. Other factors include the type of terrain... height and density of the ground cover, natural obstacles like creeks, rocky surfaces, steep hills, or wooded regions. In addition, the length of time in which the trail was laid before the tracking dog is sent forth, makes a huge difference as the scent left behind dissipates with each passing minute. 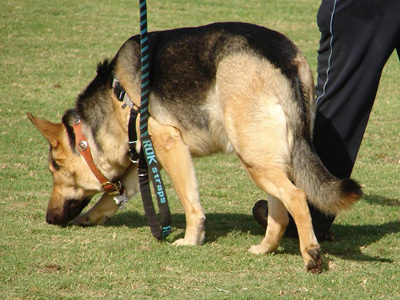 The handler is basically dependent on their dog to search readily upon command. Total trust and faith are essentials which must be established through training. Above all, the handler must acquire an in depth skill to "read" their dog so they may work together as a true team.